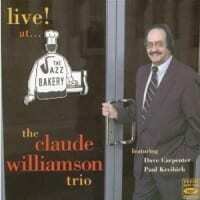 Claude Williamson, an important survivor of the '50s, had previously recorded a tribute to the innovative Bud Powell in which he often sounded very close to the masterful pianist. Williamson, who originally developed his own sound out of the Powell style, remains a classic bebop pianist. This CD from the Spanish Fresh Sound label is a live set with bassist Dave Carpenter and drummer Paul Kreibich, both of whom are tastefully supportive and take occasional meaningful solos during this performance. Throughout the date, Williamson's style is often quite reminiscent of Powell's, and he even revives four of Bud's tunes: "Blue Pearl," "Sub City," "Bud's Blues" and "Hallucinations." The other selections (including an unaccompanied version of "Yesterdays") are songs that Powell also performed (including "Sure Thing," "Reets & I" and "Blues In the Closet").